Changes in local sea level estimated from sediment cores collected in salt marshes reveal an increase in the rate of sea level rise in the western and eastern Atlantic Ocean during the 19th century and early 20th century, consistent with the few long tide-gauge records from Europe and North America. 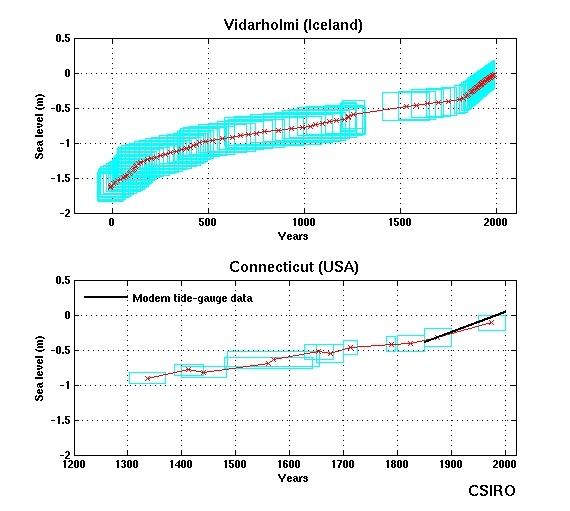 The figure below shows data from Vidarholmi, Iceland (data from Roland Gehrels, Gehrels et al., 2006) and Connecticut, USA (data from Dr Jeff Donnelly, WHOI Coastal System Group , Donnelly et al., 2004). The central estimates of sea level (relative to the present) are shown as red crosses. The light blue boxes show the uncertainties (in height and time) of the measurements. Note the different time scales of the two panels. Note also that these measurements are of sea level relative to the land. Estimates shown below and elsewhere on this site have the effects of vertical land movement taken out, so changes in sea level on the above figures may seem inconsistent with other graphs on this site. For example, the east coast of the USA is sinking due to the ongoing effects of the retreat of the Laurentide Ice Sheet at the end of the last Ice Age, so the rate of sea-level rise relative to the land is higher than it would otherwise be. 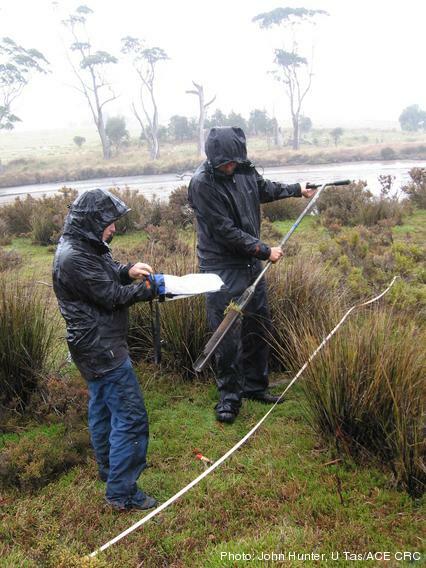 Roland Gerhels has recently visited Tasmania and collected a sediment core with the aim of determining the relative sea levels over the last several hundred years along the east coast of Tasmania. The few very long tide gauge records all show an increase in the rate of sea level rise from the 18th century. 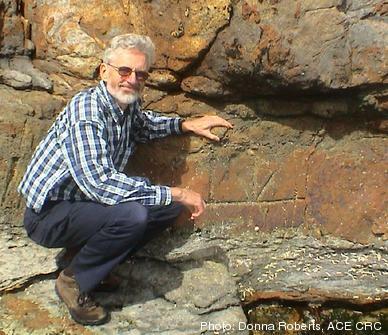 One of the oldest tide gauge benchmarks in the world is at Port Arthur in south-east Tasmania. When combined with historical tide gauge data (found in the London and Australian archives) and recent sea level observations, it shows that relative sea level has risen by 13.5 cm from 1841 to 2000. 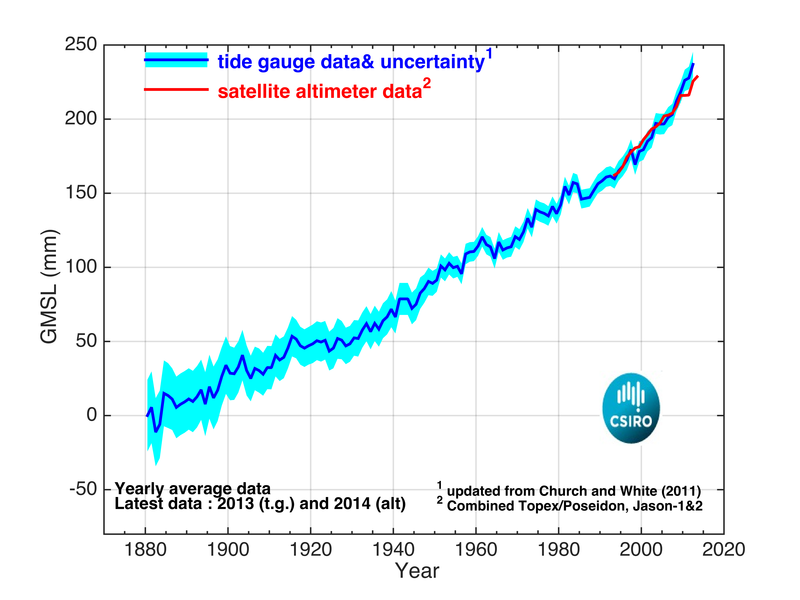 We have used a combination of historical tide-gauge data and satellite-altimeter data to estimate global averaged sea level change from 1880 to 2014. During this period, global-averaged sea level rose about 23 cm, with an average rate of rise of about 1.6 mm/yr over the 20th Century. The sea level record indicates a statistically significant increase in the rate of rise from 1880 to 2014.